During the land wars in 1864 both Pa sites on either side of the gully were destroyed by the militia and in retaliation a month later a group of soldiers was ambushed and seven killed on this spot. During World War ll the site was used as a radar station, Unit 11, one of the 19 radar stations throughout New Zealand. The station was camoflouged by the airforce to look like a hostel, even to the extent of having 'Oakura Hostel' painted boldly on the roof. This was to fool any enemy aircraft flying overhead. The officers working at the station were under strict instructions not to tell anyone what they were doing. The station was guarded 24 hours a day by an armed guard. The station had a 12m high aerial which was used to pick up signals at sea. Headquaters in Wellington were informed if any craft movement was picked up. Full alert was called if they were unsure of what it was. The Hudson bombers based at Bell Block were called out if it looked serious. The station was staffed by up to 70 personnel, made up of wrens, waafs and air force personnel. Staff spent four hours on duty and eight off, with watches being split into three shifts made up of a radar mechanic and about seven operators. In 1944 the unit was disbanded and administration building, transmitter and receiver all went up to Te Rapa. There is little sign of the station now apart from the old shed which used to house the half-tonne Ford truck. Look out for it when you visit the garden. 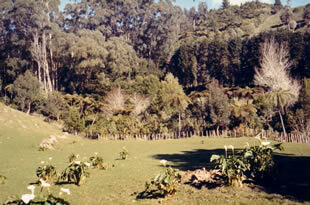 A beautiful peaceful area known as Lucy's Gully is situated at the western end of the Kaitake Range. The area was named after Ruhira Matekai who was also known as Lucy Stevens. She was born in the gully around 1820. 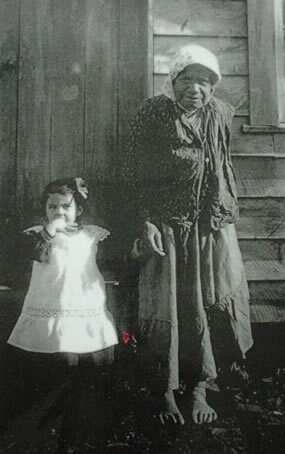 Lucy was known on the coast as a kind, fine person who loved all the local children, Maori and Pakeha. Her husband and two sons died many years before Lucy and are all buried in a plot which is now known as Lucy's Gully. 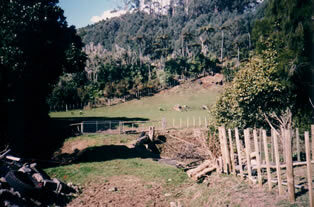 The gully was widely planted by the large Maori population in food crops. Lucy and her family were members of the community who gardened this area before the turn of the century. Lucy is also remembered as a member of the Okorotua Pa which is by the Oakura River, opposite what is now known as Corbett Park. Lucy developed a thriving business selling whip lashes or crackers which were plaited from flax and sold to teamsters and drovers for use on the ends of their whips. She sold these articles from a position next to the blacksmith's shop on the corner, which is now called Hau Hau Lane, just above Okorotua Pa. From here she also sold flax kits, other handware articles, mushrooms and blackberries. Every year Lucy would make the long trek from Oakura to the burial place of her husband and sons, where she then spent twenty-four hours grieving and fasting. Lucy continued this tradition of mourning until her death in 1916. She is buried with her husband and sons by the Waimoku stream, as this was the place of her whare (home). Waimoku is the little stream that runs through Ngamamaku Garden and reaches the sea at Oakura Beach (beside the camp store). October 1986: Tony and John purchased Ngamamaku and began clearing the site of rubbish, put in some fencing and began various earthworks. 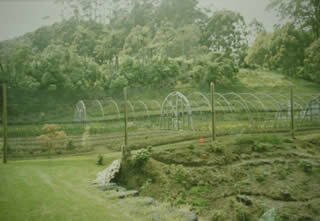 1988-March: Cyclone Bola destroyed poly tunnels and much of the relatively new planting. Many mature trees were blown down. 1989: Repaired damage from 'Bola'. Replanting and establishing earlier plantings. 1990-March: Severe floods (18 inches of rain in 36 hours) created havoc. The creek calverts collapsed and the entire creek dell area was flooded with water. It was then buried under silt and sand as it slowly cleared. The summer was spent clearing mess caused by the flood and replanting dell area. 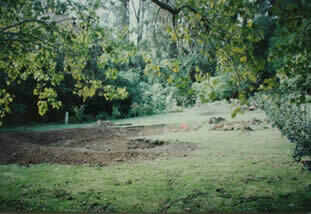 1991: Top pond developed and planted. 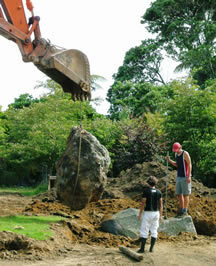 Swimming pool and surrounding rockery built. Track put into upper bush areas. 1992: Circular rose garden developed and planted. 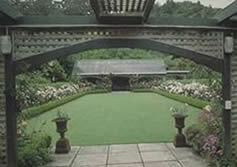 Garden opened to the public for the first time. 1998: Extended the Nikau walk. Extended Summer House area, added a gazebo. 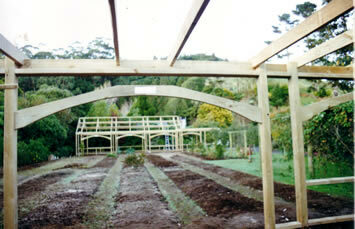 1999: Removed old shade houses. Developed a small rose garden by the aviary. 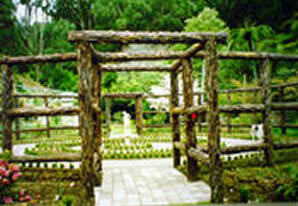 2000: New shade house area development for clivias. 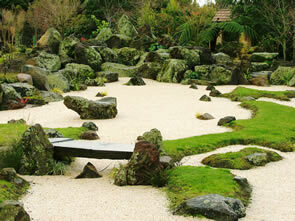 2001: Initiated planning of a Japanese garden with Japanese landscaper. The garden to be developed over the next three years.